Lukits, Ann, “Waving Bye-Bye Linked To Babies’ Development,” Wall Street Journal, 12/3/13. Waving “Bye-Bye” is an important social and motor milestone that may be achieved during baby’s first year. Learned through the skill of imitation and by the coordination of visual skill with fine motor skill, this skill is a lot of fun for babies. Think of this skill as a somewhat complex version of grasping and reaching since the arm, hand, and fingers are involved. Some babies wave by moving the wrist up and down and some by turning the hand round and round. Observe the baby in the top video from Brandon Cassidy’s youtube channel. He keeps his arm quite still as he moves his hand from side to side. 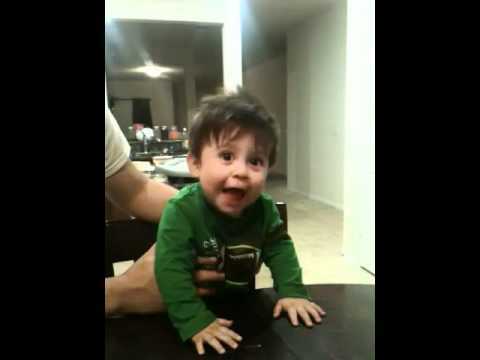 In the second video from Blanca Anderson’s youtube channel the baby waves by moving both his hand and his arm up and down. This baby appears to be younger than the baby in the first video and the movement of his wave is less refined. In time, he will learn to hold his arm still and move only his hand as the older baby can do in the first video. A recent article in the Wall Street Journal took a close look at current research regarding this important baby milestone. The article focuses on a recent study in Pediatrics International which found that premature babies learned the skill of waving bye-bye significantly later than full-term babies and they also used different hand and wrist movements. The study compared the skill of waving bye-bye in 597 full-term and 95 premature babies in Japan. Mothers reported the age when baby learned to wave goodbye and the infants’ hand motions were recorded by video camera at well-baby checkups and later analyzed. Researchers present at the check-ups waved bye-bye to the babies to see if they would imitate them. This study highlights the differences between the full term and premature babies in learning this skill. Most full-term babies in the study achieved the milestone of waving bye-bye around the age of 10 months, and all of them achieved it before their first birthday. Premature babies learned the motor skill of waving an average of one month later than the full-term babies and 57% achieved the skill by their first birthday. Learning the milestone of waving occurs as babies coordinate their fine motor skills and their visual ability to imitate an action observed. This entry was posted in BABY RESEARCH and tagged 9-12 months, coordination. Bookmark the permalink.